At Love Beauty and Planet® their goal is to make you more beautiful and give a little love to the planet. Love Beauty and Planet® are committed to small acts of love for the planet. Their goal is a carbon footprint so small it's like we weren't even here. They started their journey by loading their beauty products with goodness. Every one of Love Beauty and Planet® bottles is made from 100% recycled materials and are recyclable. Their caps and pumps aren’t made from recycled plastics yet, but they're working on it. 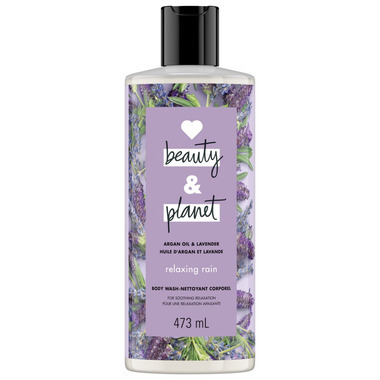 Love Beauty and Planet® relaxing Argan Oil and Lavender body wash is made with no sulfate cleansers, no parabens and is infused with plant based cleansers, leaving you and the planet a little more beautiful. Calm the spirit and mind with heirloom French Lavender, ethically sourced from the Drôme Provençale Region of France. How to use? You know it - squeeze, lather, rinse. Go easy on the tap. Don't stop with soft and smooth skin! For brilliantly beautiful hair, try Love Beauty and Planet Argan Oil and Lavender Smooth and Serene Shampoo, Conditioner to complete your beauty routine. At Love, Beauty and Planet, they are starting a beautiful movement by spreading small acts of love. I love it I've been using it for months! I love the lavender smell too. Not overpowering. Bought some for all my girlfriends I love it so much! Gave this out as a gift and the recipient loved it! I love this body wash! After a shower, it leaves my skin soft and delicately smelling of lavender.